Well, we're following Sistina (intrigue with the body of Christ) with a book concerning intrigue about the anti-Christ. The book was first published in 1990. 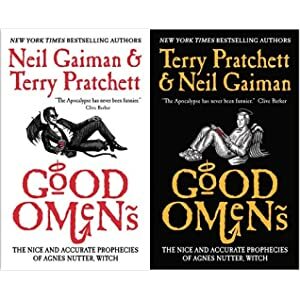 Pratchett (of Discworld fame) and Gaiman (of Sandman fame) may seem an unlikely combination, but the topic (Armageddon) of this fast-paced novel is old hat to both. You see, there was a bit of a mixup when the Antichrist was born, due in part to the machinations of Crowley, who did not so much fall as saunter downwards, and in part to the mysterious ways as manifested in the form of a part-time rare book dealer, an angel named Aziraphale. Like top agents everywhere, they've long had more in common with each other than the sides they represent, or the conflict they are nominally engaged in. The only person who knows how it will all end is Agnes Nutter, a witch whose prophecies all come true, if one can only manage to decipher them.